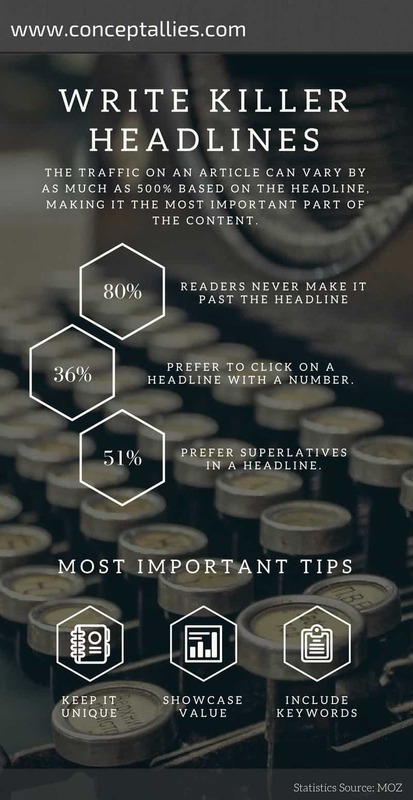 36% readers prefer to click on a headline with a number. A number gives specificity to the article and helps the writer stick to the script. Numbers are brain candy, the reader will know exactly what he will get and how informative the content would probably be. Numbered posts also attract busy readers since they are easily skim read.Try adding a number in the beginning of your headline for maximum effect. Though usually odd numbers work better than even numbers, there is no limitation to which you should use. 80% of readers never make it past the headline, making it your best shot for traction. This means that you should give quality time to formulate a headline. Many writers draft article first and then use whatever headline they think would fit in. Writing your headline beforehand ensures that you don’t deviate from the topic. Try creating 5 to 6 variations of the headline for a single topic and then go for the best one. This will result in better more focused articles along with creative headlines. Open the headline with a promise to the reader to indicate value. 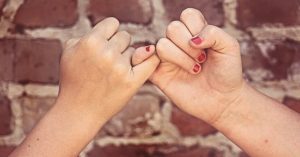 Promises push the readers to come out and actually read the content. They give readers the context about why should they care about reading the article. You can try simple examples like including a direct benefit like I did in this article. If you want to try something creating then try promises that don’t really indicate value but ignite curiosity. For example “Steal like an artist: How to Copy Inspiring Ideas From Your Competitors”. Ensure that your headlines convey what your content offers. Over-promising or misleading titles will negatively impact your site’s authority and bounce rates. Read More: How to make a content plan for inbound marketing in 5 steps? 51% people prefer a superlative in a headline. Try using best, ever, perfect, smartest etc. in your headline copy. Superlatives work because people are inclined to click on something that promises better than average content. There is a huge pile of content out there. The situation of content overload has made people fancy articles that deliver the best in the industry. This can also give an SEO advantage because people generally use words like ‘top’ and ‘best’ while searching. Everyone is trying common headlines, the ones which people have heard multiple times.By bringing something new to the table you can easily earn more traction and click-through rate. To ensure that your headline is unique you can search your headline using double quotes (“Your Headline Idea”) on google. While trying to create a unique headline don’t try to use overly complicated language. Use simple words and tie them in a creative way. Complicated language can result in loss of traction from potential visitors because they couldn’t understand the topic. Copywriting is more than just attracting visitors. Know the job role of a copywriter. Clickbait is the use of over-smart titles to attract a large number of visitors to your posts. You should always avoid this technique if you want to establish your authority online. Clickbait is when you either over promise and under deliver or make a completely fake promise in the first place. At some point, your audience will understand your technique and stop clicking on any of your articles resulting in long-term losses. Trying including a direct keyword in your headline for SEO benefit. For example, I used “What do Copywriters DO?” in my headline copy for an article on the job role of a copywriter. Many copywriters still rely on Google as their main source of traffic. By optimizing your headline for search engines you can ensure steady long-term traffic to your post. Also, your headline and URL need not be same. If possible remove any stop words from your URL to make room for more keywords for SEO. By following these headline tips you can create a lot more effective titles in lesser time. If you are looking for someone to enable you to leverage content marketing then feel free to connect. I provide consultation on pro bono basis for startups and would love to associate with high impact companies.